Q: How do I register AbstractCurves? A: First open the "Enter registration information" dialog by clicking on the "Key Icon" which is located at the bottom left of the program's interface. Or, you can just press Ctrl+R on your keyboard and the entry boxes will appear. Q: How can I determine if my copy is registered? A: Press Shift+F1 to open the "About" window and then inspect the "Licensed to:" field. It will indicate the registration status. You also won't see any Key Icon anywhere. Q: Every time I try to register I'm told that my registration data is incorrect. A: You really have to make sure that you are filling in both fields of the registration form. Cut and paste is best for the key. Just be sure you don't copy over an extra space at the end. You can also use Ctrl+C and Ctrl+V to enter the data or the cut/paste buttons located on the right side of the entry fields. Q: There is no key symbol to click on in order to register, so how do I get the program registered? A: It could be that your copy is somehow already registered. If you wish to register again with a paid license (after perhaps using a friend's key on a trial basis then realizing you really want to support us), you should first uninstall the program, making sure you enable the "License info" checkbox when uninstalling, then reinstall it using your new key. Q: How do I purchase an activation key for AbstractCurves? 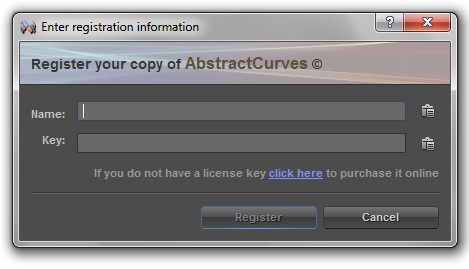 A: You can "Buy an AbstractCurves Registration Key - Activation Code" here. 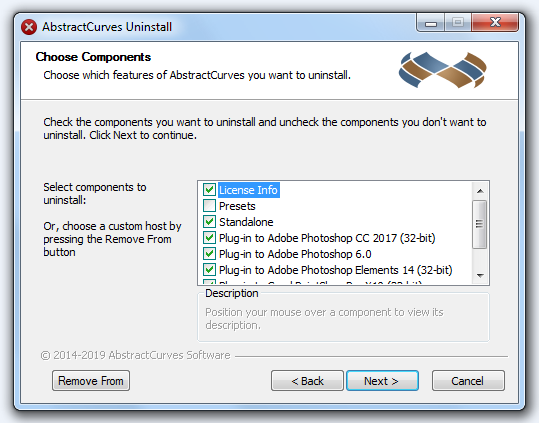 Q: How many of my computers can I install AbstractCurves on? A: Purchase of the program provides you with a lifetime license for one computer only, but it may be used for both home or business use. Q: I lost my license key. How do I regain my copy/license? A: You just contact us at support@abstractcurves.com and we will verify your purchase and resend you your registration data. Q: Can I use your graphic design software commercially? A: Yes, the paid version allows you to use AbstractCurves for commercial use. Q: Will I have to purchase the program again when version 2.0 comes or do I get free upgrades for life? A: So that we can stay in business, upgrades to future versions of the software will only be free within identical version numbers. For major version changes, upgrades or new purchases will require additional payment in some form. Q: Where do I download the program? 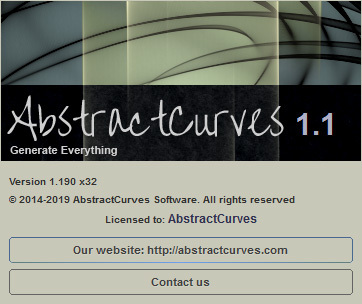 A: You can "Download AbstractCurves" and get "AbstractCurves Installation Files" here. Q: I can't seem to install or connect AbstractCurves with my graphic program host such as Photoshop or Irfanview. How do I do it? A: First make sure that your graphic host supports 8bf files. Then you can connect to your graphics host manually by using the "Add Host" button which is on the bottom left of the components page of the installer. Q: Is the extremely reasonable price of this product a one time fee, or is it some kind of monthly subscription? A: It's a one time fee. The program is yours to use forever. Q: Is there a user manual or instructions for this software? A: You can either press F1 to view the Help Menu or click the icon with a question mark at the bottom left of the application window and then select the topic you need help with. Q: How do I update the software if you make revision changes? A: There's no need to uninstall first. You can simply install it right over the old version. But before you do, just be sure that your license covers the proper version. In other words, if you install a Version 2.1 over a 1.8 you will either need to buy a new license or revert back to the latest 1.x if you only have a 1.x license. Q: I use both 32 and 64 versions of PaintShop Pro X8 (or some other compatible host). Which version of AbstractCurves should I use? A: You'll need to install both 32 and 64-bit versions. This is because 64-bit plugins only work in 64-bit graphic hosts and 32-bit plugins are only compatible with 32-bit applications. Q: How do I integrate with programs like Photoshop CC15 (32 bit) and Photopaint X7? A: When you first install AbstractCurves it looks on your PC for supported graphics applications and displays them on the components page. You can also manually add your graphics application to the list by using the "Add Host" button (located at the bottom left of the components page of the installer). Just make sure that your graphics program supports 8bf files. Q: Does the demo come with a Photoshop plugin for trial use as well? A: Yes. The installer includes Standalone and Plugin versions. Q: How do I save a larger or smaller image? A: Just click on the New image icon and select any size you want (up to 32000px). The icon is at the top left of the application window. Q: How can I copy my presets? Where are they located? A: Presets are .ffx files stored in the C:\Users\[UserName]\AppData\Roaming\AbstractCurves\1.1\Presets\Galleries\ folder. Q: Whenever I save an image, the result is not what I see on the screen. What's wrong? A: First, just note that Viewing Quality has no relationship to Render Quality, unless you really want it to. The default is the very best render along with your choice of fast to slow viewing. It's likely that you have selected Low, Medium or High viewing quality in order to speed up the ability to preview what you are creating. Highest is an option as well but it can be slow depending on your system. Viewing time is different from the actual Render time, which is really quick even though it is set for Highest Quality, since it doesn't have to be constantly churning out calculations for a changing display image. If you do actually want to save an image at these lower quality levels you must first disable the default "Use highest quality rendering when saving" checkbox within Preferences. The Preferences cogwheel icon to open the option panel is at the bottom left corner of the application window. Q: Is there a reset option for an image, or do you only have "Undo"? A: Luckily for you, we included a "Reset to last saved state" button. It is at the right of the "Presets" panel. Q: Even though I'm assuming that clicking "OK" should render, I'm always asked to save an image before exiting. Why is this? A: Rendering actually restarts each time you adjust the settings or select a preset, so it's always in flux. Saving an image is slightly different and assumes the render has completed. Q: What do the Exit Program options do behind the scenes? If you click "OK", the current program settings will be saved to the registry and AbstractCurves will close. This way, when you launch the program next time, the saved settings will be applied to both the loaded image and the interface. When using the plug-in version, pressing "OK" does the above and returns you to the host application. If you press "Cancel", you will quit the program without saving. When using the plug-in version, AbstractCurves will close and return you to the host application without saving. This is a standard behavior for graphics apps. Q: Is there a way to create random images? A: Not as of yet. We are considering it for future versions. Q: How do I position the top layer image around on top of the background image? Currently I can only move both around at once but I want to shrink an image and specifically place in somewhere on top of the background. Currently it seems fixed at the center. Q: Is there any way to output a vector image, such as .svg or a .pdf rather than a bitmap image like png, jpg or bmp? A: The output format in AbstractCurves is currently restricted to a bitmap image only (png, jpg or bmp), but there are many free and paid applications which will convert bitmap images to vector graphics format. Q: Do you have an animation option? Q: Do you have a 3D stereoscope option? Q: Do you have plans for a Mac version of AbstractCurves? A: Yes. We are planning to add Mac compatibility to the next major update.